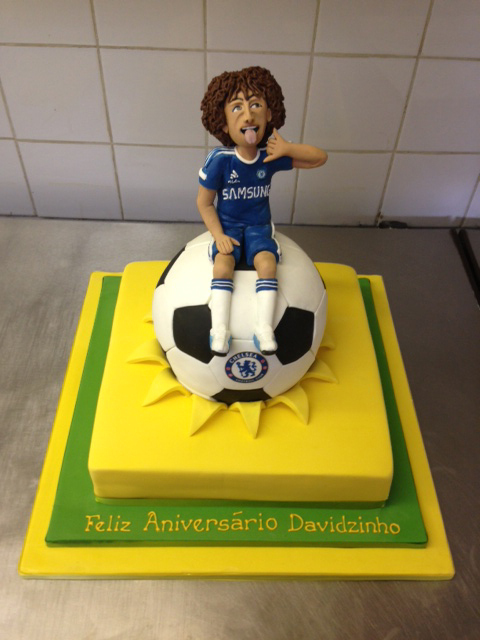 This week the team at Cakes by Robin were proud to be part of the birthday celebrations for David Luiz! David, a Chelsea football player, celebrated his birthday yesterday with a fancy dress party. While David chose to go dressed as a Chelsea Pensioner his fellow Chelsea team mates chose outfits including Batman, Robin, Superman, Zorro and Julio Cesar, a QPR player even came dressed in a Chelsea football shirt and wig in a send-up of Luiz himself! There are more photos of the party and you can even see our cake in the Daily Mail write up of the celebrations today. Cakes by Robin enjoyed making David’s novelty birthday cake which consisted of a Chelsea branded football sitting on a base cake in David’s native Brazilian colours of yellow and green and all topped off with a hand made sugar figure of David sitting on top of the ball with his trademark pose of sticking out tongue! Happy 26th Birthday David! We hope you all enjoyed the cake.